as a three manual seven rank Robert Morton from the California Theatre in Glendale, CA. in Long Beach. From there the organ was stripped of all of its theatre equipment and installed at the First Baptist Church in Long Beach. Then the organ was moved to the Church of Latter Day Saints in Porterville. the organ at one time or another to restore pieces back to the original organ. Over the years the organ grew to double the original size. 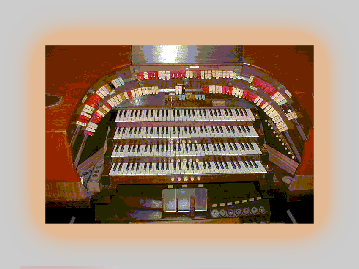 Then a 2/10 WurliTzer was added to it. Although not everything is playing due to a lack of stop tabs on the console, there are 24 ranks of pipes sitting on the winded chests. More stop tabs on the console will allow the balance of the organ to be played.